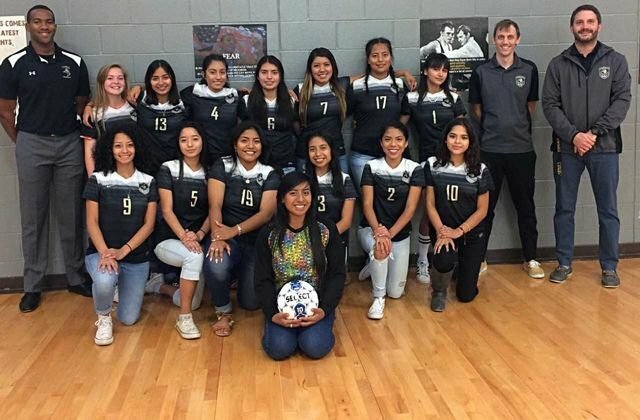 Your Lady Vikings soccer team won their 2nd game in a row on Friday night against their across I-35 rivals, The Lady Raiders of Reagan High School. In what was an intense, hard fought battle by both teams, regulation wasn't enough with the game ending in a 1-1 tie and the Lady Vikings prevailing in a PK shootout 3-2. Once again, our ladies showed what being Viking tough means by falling down 1-0 early in the 1st half and having an early go ahead goal by Diana Ramirez disallowed on a highly questionable call. With positive minds heading into the 2nd half, Cindy Moreno quickly equalized 1-1 with what is surely our top goal of the season. Seriously, this was a premiere league level goal (video below). The entire 2nd half was dominated by Lanier with multiple shots going wide or narrowly being saved by the Reagan keeper. Possession was 60-40 in favor of Lanier. Before taking PKs, 5 young ladies stepped forward and asked to be on the PK takers list. Young freshman Leslie Salinas also stepped forward to fill in as goalie during the shootout to take advantage of her superior height and quick reflexes. Kenia Diaz, Grace Bennie, and Marilyn Medina all buried their PKs in the back of the net with only Evelyn Castro having hers kept out on a quality save from the Reagan keeper. With the PK score 3-2, Leslie Salinas came up huge once again with an amazing save to end the night with a win. Though not needed based on the scoreline, Leslie was prepared to take the 5th and final PK if need be. Pretty amazing considering she is in her first year of high school soccer. Wow. Currently the Lady Vikings sit at 4-6 in district with an outside shot of making the playoffs if they can string a few more wins together. Please some out and support them on Tuesday night at Nelson Field as they take on the Lady Cougars of Crockett High School. Varsity @ 7:45, JV @ 6, JVB @ 4:45. The Lady Vikings soccer team earned a resounding 8-0 victory last night over the lady Rebels of Travis High School. Lanier owned possession the entire game while accumulating a massive 20 shots with 15 on goal. Maria "Spiderman" Salgado was only asked to make 1 save during the game and admitted to being bored with not much to do. Goals on the night came from Kenia Diaz -2, Cindy Moreno - 2, Grace Bennie - 1, Evelyn Castro - 1, Marilyn Medina - 1, and Leslie Salinas - 1 on her 2nd PK of the year. Though she didn't notch a goal, Diana Ramirez was totally unselfish last night and added two assists to the stat sheet. Evelyn Castro also added THREE assists on the night for what we're calling the "Hat Trick in Our Hearts". Stellar defensive work came from Leslie Salinas, Iris Aguilar, Katherine Aguilar, Gisselle Garcia, Melisa Gonzalez, and Ana Nepomuceno. Please congratulate these ladies on a huge win and an incredible overall team performance. Prior to the varsity match, the JV team picked up a hard fought 1-0 victory over the Lady Rebels JV squad. Much like the varsity, the Lady Vikings owned possession, created tons of chances, but couldn't quite find the back of the net. In desperate need of a goal with 10 minutes to play, Coach Myers made the genius (or was it insane?) call to sub out his superstar goalie America "Little Ronaldo" Reyes so she could get on the field and create something. Yet again, America came up huge with a crazy, left footed goal into the side netting only 5 minutes after coming onto the field. And yes, the celebration was again incredible. America is the current goal leader for all teams while seeing limited minutes mostly as a super sub. Well done ladies! The Lady Vikings continue their path through district play on Friday night at Nelson Field against rivals Reagan High School. JV @ 6pm/Varsity @ 7:45. JVB will take on Eastside Memorial JVA @ 4:45, also at Nelson Field. Please come out and support these hard working ladies as they continue to improve with each game. Over the last several weeks, the Lady Vikings soccer team has discussed what it takes to be mentally tough in the face of adversity. Fighting through a growing list of injuries and illness, the ladies proved last night that they are in fact a mentally tough team by winning in come from behind fashion 2-1 over the Reagan Lady Raiders at Nelson Field. Finding themselves down 1-0 at half via a questionable PK given to the Raiders, the Lady Vikings were confident at half time that we were the better team with more clear chances and better overall ball movement. Fifteen minutes into the 2nd half, our hard work paid off with a PK awarded after a nasty challenge in the box on freshman workhorse Gladis Mendez. While many junior and senior leaders refused to take the kick, freshman superstar Leslie Salinas stepped up and calmly slotted a beautiful goal into the side netting. For those unfamiliar with the game, a PK can be one of the most nerve racking and tense moments of the game, but Leslie showed true character and competitiveness by stepping up in the time of need. For the next ten minutes, Lanier controlled possession, never panicked defensively and created several clear chances for the go ahead goal. Clearly frustrated with her team's inability to score, Cindy Moreno won a nice challenge with 10 minutes left in the game and proceeded to race 30 yards down the sideline, cut in towards goal and power a laser shot into the back upper 90. No assist needed, Cindy did this one all on her own. The ladies then played 10 tense minutes of defensive soccer to hold on for the huge come from behind victory. Other key players included Maria Salgado with several huge saves in goal, impressive defensive work from winger turned left back Melisa Gonzalez, key minutes off the bench from Sinthia Bautista, and incredible pace and work rate from midfielder Diana Ramirez. This moves the Lady Vikings to 2-1 in district and puts them tied for 2nd place. They continue their journey towards a state playoff spot with a game against the Crockett Lady Cougars on Saturday at 10:45am at Burger Annex. JV @ 9am. JVB @ 12:45. I'm sure they'd love to see you out. JV leader America Reyes promises at least 1 goal with a celebration dedicated to any staff in the stands. After a rough night on Monday to begin district play, being shutout 2-0, the Lady Vikings soccer team erupted on Saturday morning with a resounding 10-1 victory over the Travis Rebels. Amongst rain and humid conditions, your lady Vikings finally came together as a team with the ball rarely leaving the opposing team's half. Goals came from all around with Marilyn "I don't know half speed" Medina, and Emily "I worked the late shift" Jaramillo both scoring two highlight reel goals. Contributing with some amazing goals of their own were superstar freshman Gladis Mendez, Lainey "my boyfriend is watching" Huerta, Diana "Did you see my header?" Ramirez, Grace Bennie, Kenia "I break ankles" Diaz, and the one and only "Evelyn Show" Evelyn Castro. Our amazing keeper Maria "All State" Salgado also made a few saves while twiddling her thumbs in goal. Maybe we can get her a nice book to read for games like these? Also, big congrats to our central midfielder Cindy "The Wheels" Moreno who earns MVP honors for her constant work rate and total unselfish play. feeding her teammates on multiple goals. Congrats also goes out to our JV team for a big 3-0 win. America "Little Messi" Reyes continued her hat trick average on the field with yet another 3 in the back of the net. If you have yet to make it to a game, I suggest you come out if only to see her incredible Ronaldo style goal celebrations. Please congratulate all of these young ladies as they persevere and grow through multiple early season-ending injuries and setbacks. Very proud of them. Please come out and support us on Tuesday the 30th at Nelson Field as we take on Reagan High School in what should be a truly special rivalry game. After struggling to find a goal and a win in our first 2 games of the JV soccer tournament, our girls kept fighting and improving. Their tenacity culminated in a 3-1 upset over McCallum thanks to a hat-trick (3 goals) by America Reyes and a gritty team performance-- every girl played quality minutes to out-hustle and outplay the tournament hosts. It was the perfect end to our tournament. Our early morning game ended 1-1 versus Reagan; Samandra Hernandez gave us an early lead but Reagan managed to level in the second half. Andrea Zavaleta appeared to score a possible game-winner, but the ref disallowed the goal due to a dubious offside call. HUGE thank you to Ms. Aguilera for braving the cold and cheering us on! Our girls put in an amazing effort and have improved dramatically in a short span. Please congratulate them all in a job well done and come lend us your support at our next game!